Yes, can. Will. Jabber can only be serious for a certain time period. After that, well….it’s time to go back to fun and silliness. Of which she has an abundant supply. Evidently. I, being 111, find it important to scatter in a LOT of fun and stop to smell the roses. Of which I have none thanks to the dreaded Witches Broom disease which annihilated all of my beautiful Knockout Roses in the past couple of years. Sigh….makes me sad to think about them. Oh well, Hydrangeas will take their place and produce some pretty flowers this year. But not for a while. and so are the red bud trees. Here is a pretty one in our back yard. See? The little leaves are emerging! 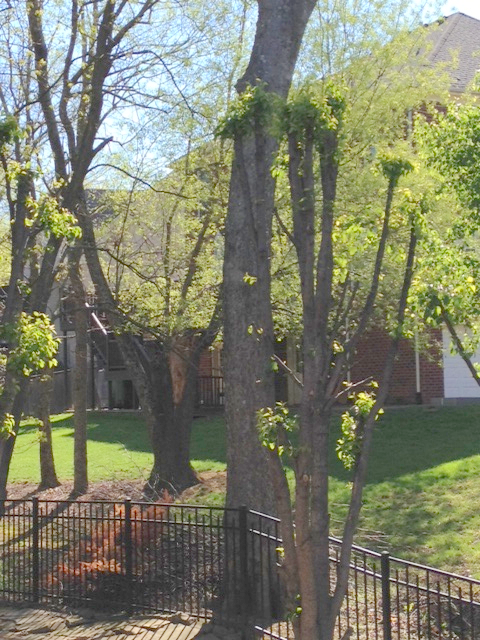 And you can see that the Bradford Pear trees have already leafed out–they’re the green ones in the above picture. 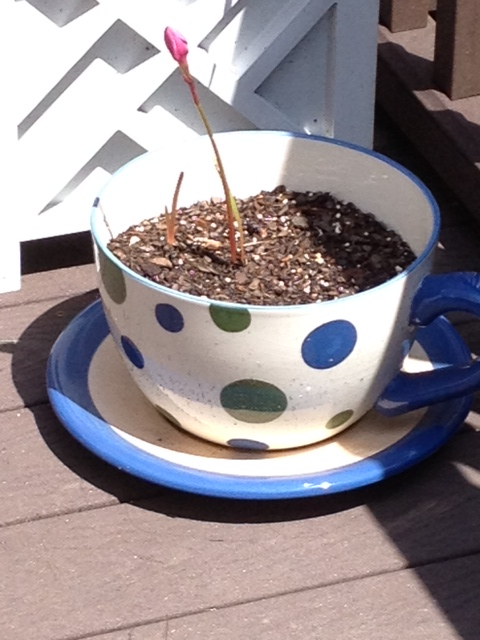 The dwarf Japanese red maple tree has returned this year, despite a very cold winter–I’m glad it survived so well. 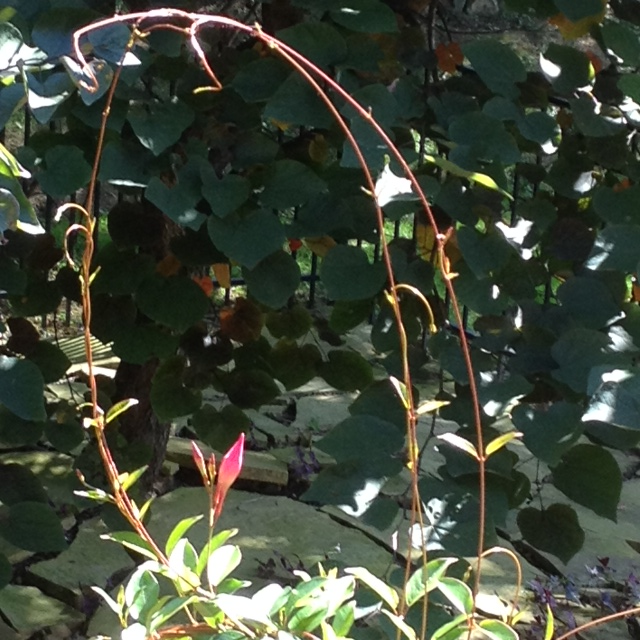 And the Laurel bushes are in bloom…. The prolific (and un-killable) mint has shown up again, soon covering all those leaves we raked into this bed last fall. It’s almost planting time! Not that I’ll be doing a LOT of planting, but a few flowers and herbs in pots will suffice to spruce up the area and the deck. Meanwhile, our Miss Spicy Royal Red Paprika is ‘blooming‘ herself….she knows now very well how to come UP the steps from the yard, but is still fearful of going down by herself. We don’t encourage it, either–we have stairs inside the house and are hoping to keep her downstairs for a while. Housebreaking a puppy takes a while and even though we have seen great improvement, we’re not totally confident about her yet. She’s never been upstairs–it will be a new adventure for her. But not for a while. Spring is springing and doing her thing. It’s pleasurable for me to take the pictures and spend a few minutes sharing them with you. 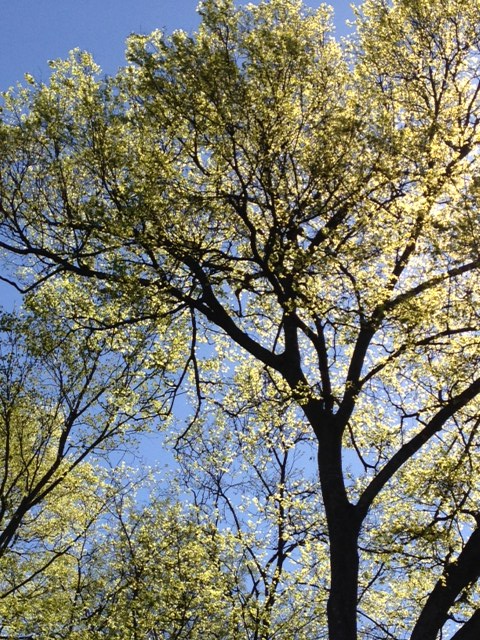 Appreciating the beautiful day and the emergence of a new season and growth is important! Take the time to look at your area and enjoy the new beginning! “Has she come into the kitchen yet like the lizard?” Jabberwocky laughingly asked. Then, more seriously, “I mean, she HASN’T, has she?” Jabber is ascared of animals AND man-eating plants, too. No, no. She’s stayed outside, quit her twirling about round and round and finally settled in one spot at the top where she continues to send out branches. 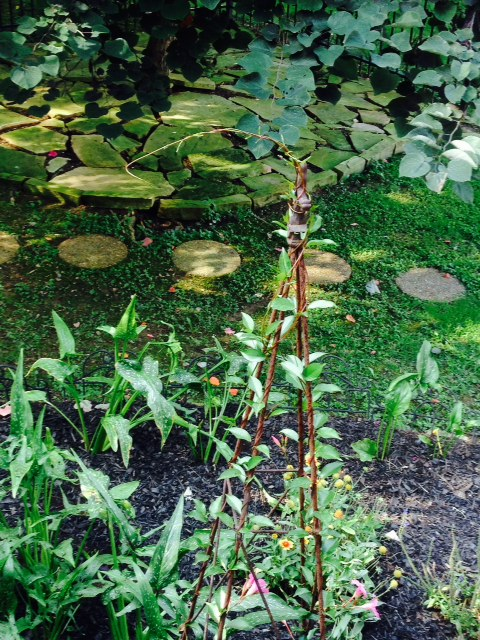 The top ones have encircled themselves now……. 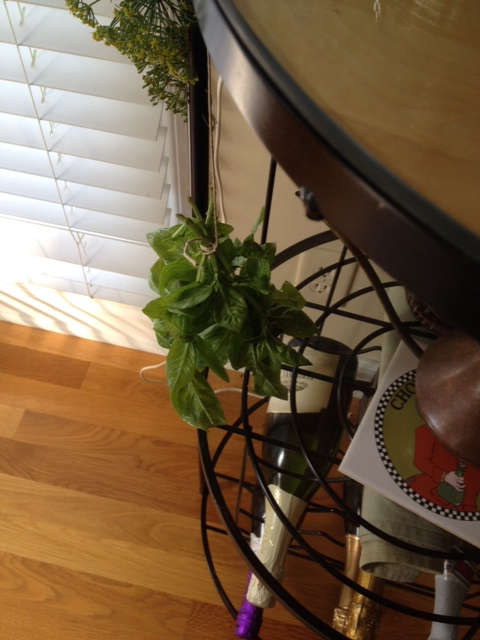 So, I do believe the danger of Audrey III has passed—at least for this growing season. P.S. No sign of Leon anywhere, either. (See previous post.) This is a very good thing. Bob the Painter arrived today to paint the garage and remarked that when I called yesterday about Leon the Lizard, Bob heard sheer ‘terror’ in my voice on the end of the line. We laughed. I still don’t want Leon to return, though. Not quite. Soon. I feel qualified to have opinions. “You always have had opinions.” Jabber muttered. Parsley, basil, rosemary, tarragon, dill and thyme grew in pots this summer surrounded by mint which comes back every year, and spreads, whether I want it to or not. So I gave up trying to control the mint and just cut it in the spring and set herb pots in the midst. 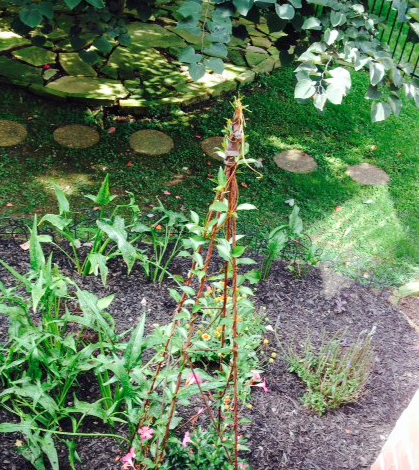 That is my herb garden, nicely contained in that only herbs grow there. 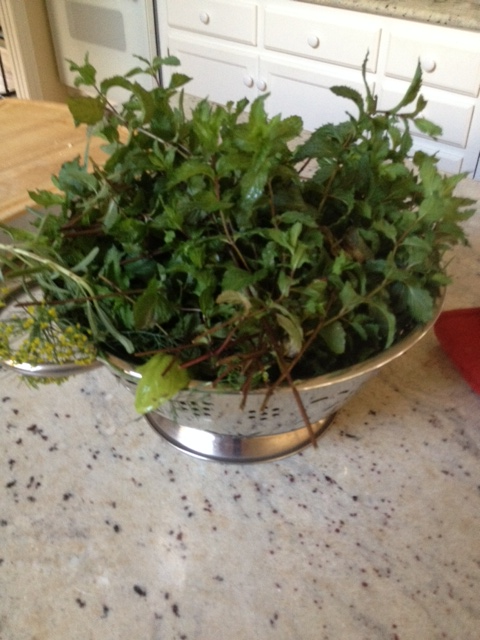 Now it is time to harvest some of these herbs for use during the coming seasons. 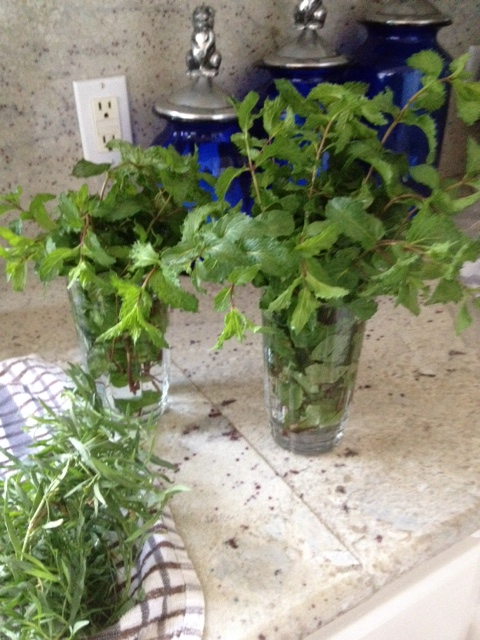 One easy method is to cut, wash, and trim the herbs and place in ice cube trays, fill with water and freeze. Once frozen, you can remove the cubes and place in a plastic bag. Use these herbs for soups, sauces, casseroles as you wish—right from the freezer. I do this with some of the herbs. 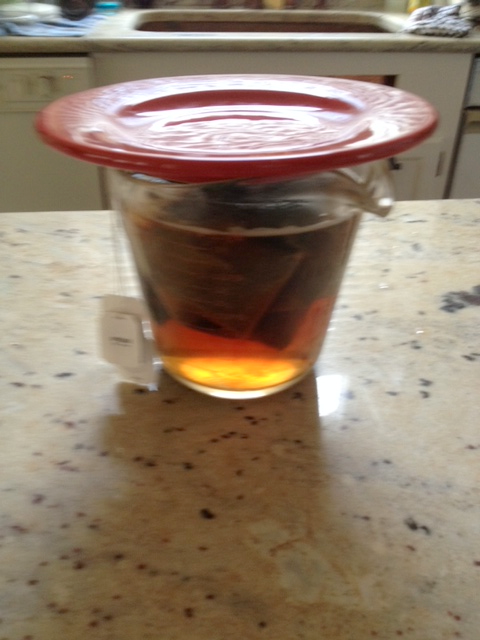 Heat water, place the herbs in the hot water with the tea bags, cover and steep for about 5 minutes. Discard bags and herbs. 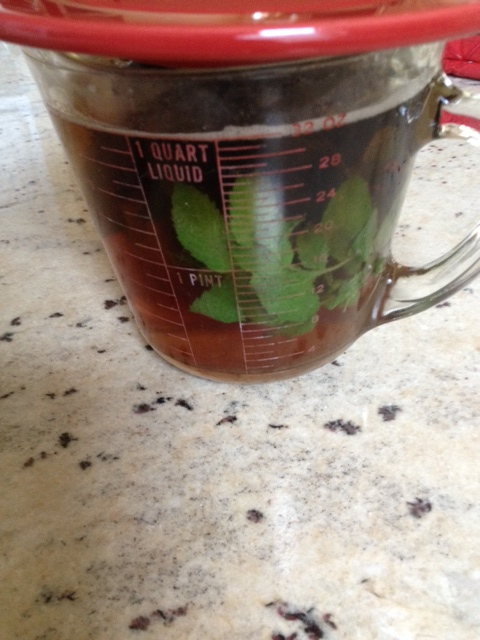 Wonderful mint-infused iced tea! 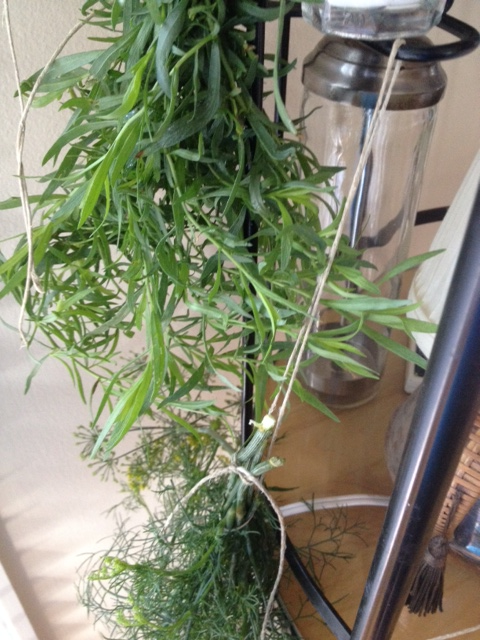 To dry herbs, simply group in bunches and lightly tie together with kitchen twine. Hang to dry for several days. 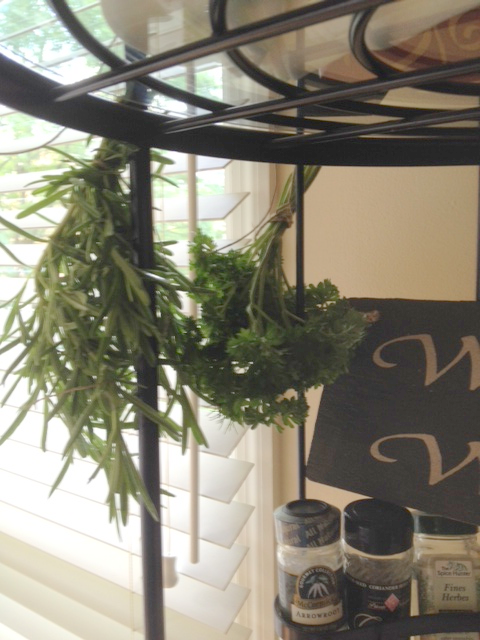 It’s handy to dry my herbs on the wine rack in the kitchen—they have a lovely aroma which is a nice scent by the kitchen table. But if you don’t have these, then an empty spice jar will do just fine. Be sure to label. These are so nice to have on hand for cooking—and to think you grew and dried them yourself is a plus. “Ok, where is the ‘losophy in all this?” Jabber inquired, impatient to get to the point. Aside from that, how do you think people acquire wealth anyway? By spending their money on things which could be obtained in a less expensive manner and/or for less money? Spices, like many items, are quite expensive today. Go to the store and price them! For minimum cost, I had “decorative” plants all summer—acquired them at a good price early in the spring, simply planted in pots (obtained at yard sales, of course!) 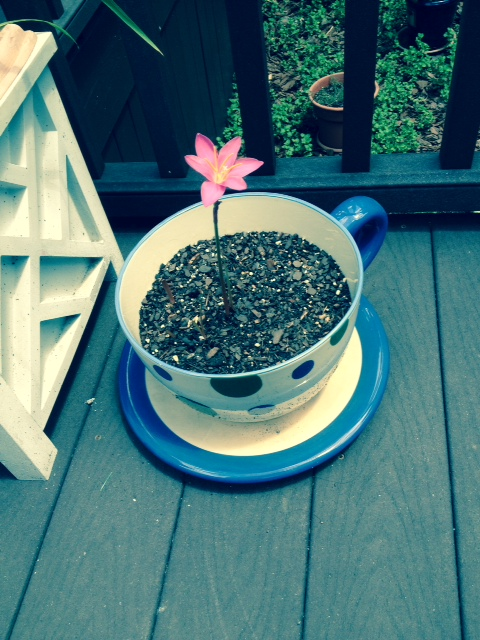 with dirt which I did purchase—a little fills many pots—and watered. 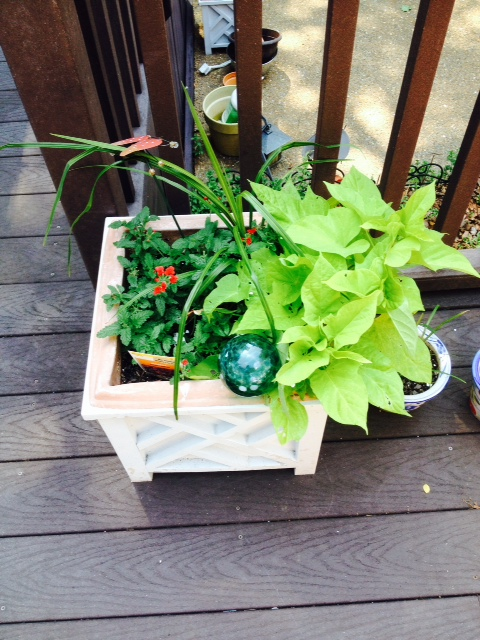 If one is going to have ‘greenery’ in one’s yard or on one’s deck, it makes sense to plant something one can eat! 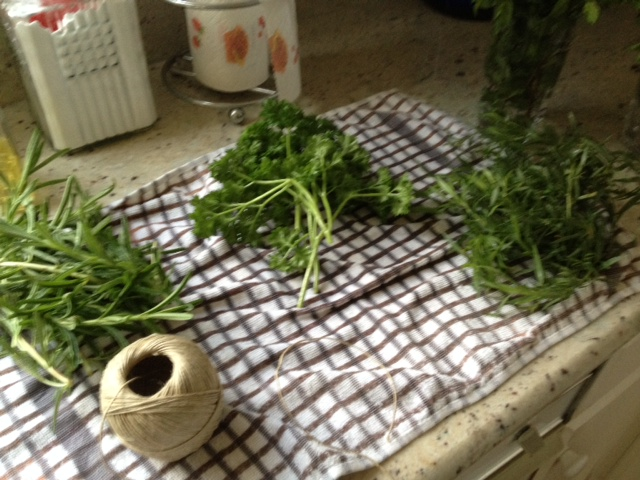 It took about 30 minutes to cut, wash and hang all these herbs to dry—and I will have additional cuttings this season. That likely is the equivalent of spending close to $20 or more in herbs. As it has always been, so it is now: Waste not. Want not. Plan ahead. Be organized. Take time to take care (of yourself, your family, your friends, your things, your life, your money). Save the pennies and the dollars will grow. Even in your 100’s………years, that is. 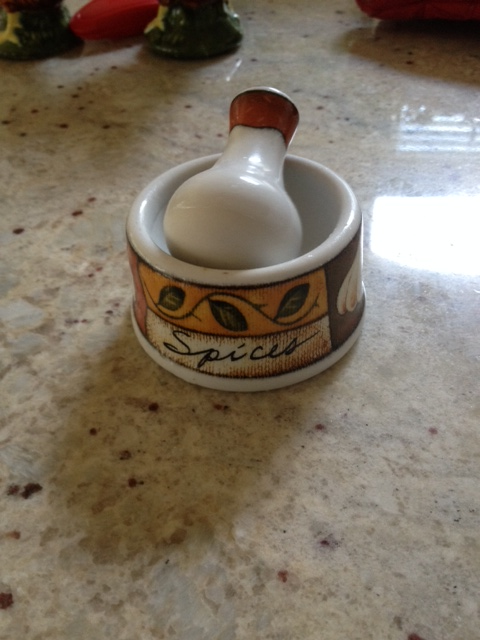 At the very least, you will have excellent spices on hand to flavor your foods! Happy Harvesting! 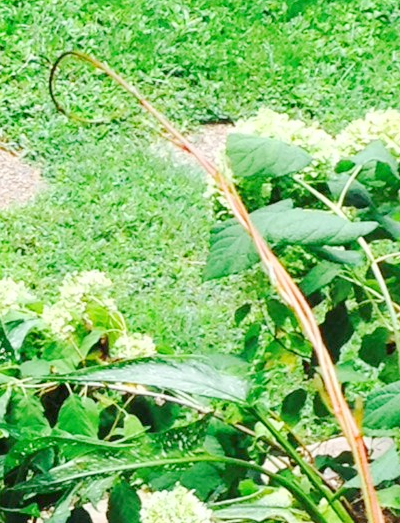 Aside from weeds, what else is up in your gardens or pots? I planted ours very late this year. 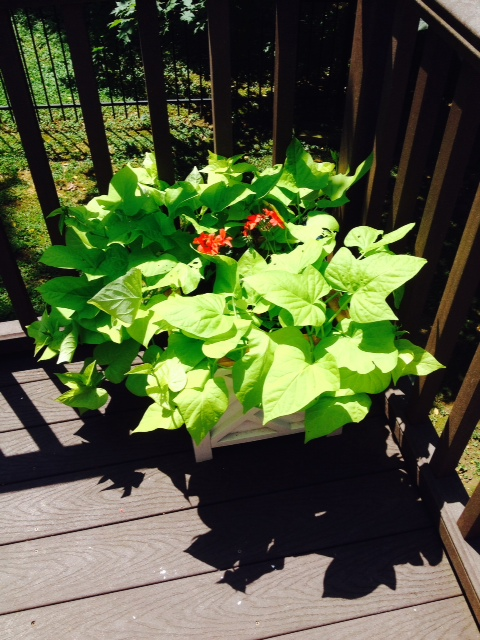 Trying to keep costs at a minimum, but still have some color on the back deck in pots, I dug up some sweet potato vines which had ‘wintered over’ inside their pots. Chopping the larger sweet potatoes (yep, they become sweet potatoes and no, I’ve never eaten any), I replanted a piece in several pots, covered with soil and watered. 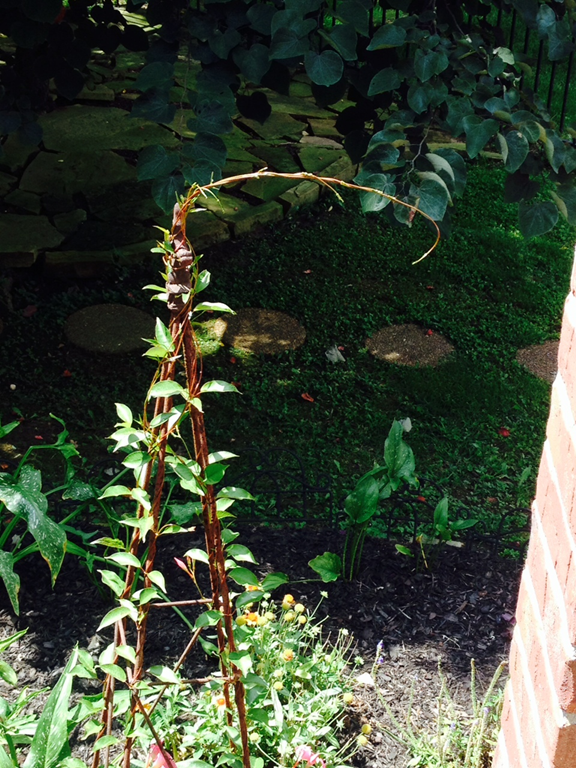 It is very easy to root sweet potato vines—just cut off a few leaves and stick in water. In a couple of weeks, each leaf will have roots. Plant in a pot and voila! a new plant will grow. If you have patience, this is a great way to save some money for the ‘viney’ look you may want in your pots. 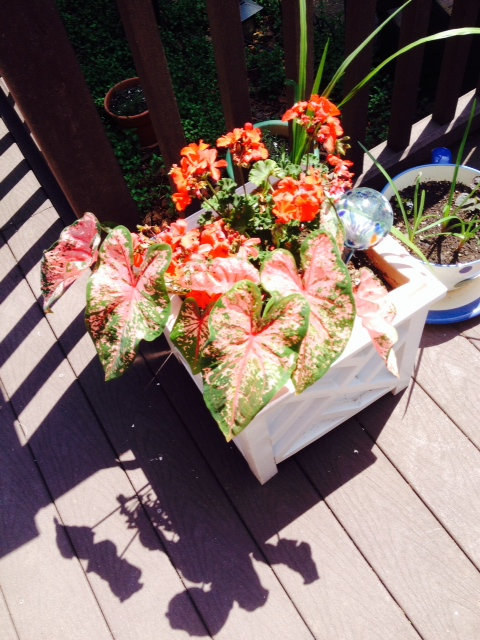 Of course, I did buy a few geraniums and ‘spikes’ to add to the pots. Below, some caladiums (I think that’s what they are—if you know better, let me know please) came back up—actually they were trying very hard to poke through the soil in their pots whilst still in the basement. They got a new home and some plant food and seem quite content. 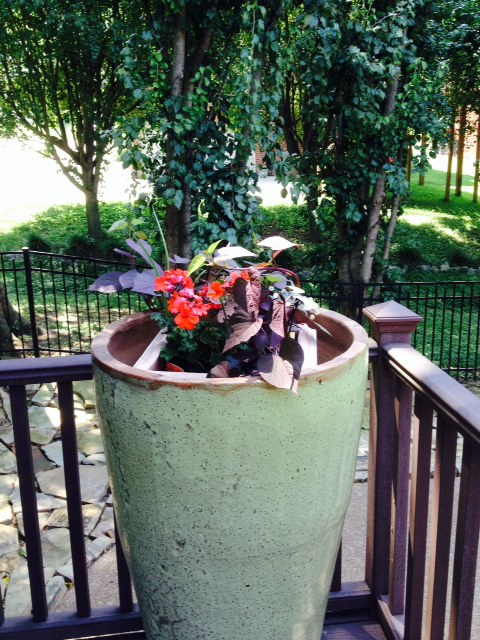 In the largest pot, below, I place a planter; you can see the edge of it at the top of the pot. After placing it inside, I discovered a bird had a nest below in the pot. The bird and I were ‘at war’ but that seems to have ended. I think the babies grew up and flew off. Stumbled/tripped across some information for keeping bugs off the sweet potato vines—actually it is a spray one concocts for black spot on roses. Since I was spraying the roses today (every 2 weeks, but I think my roses are gonners even though I’m trying to save them*), I sprayed some of the solution on these vines as well. 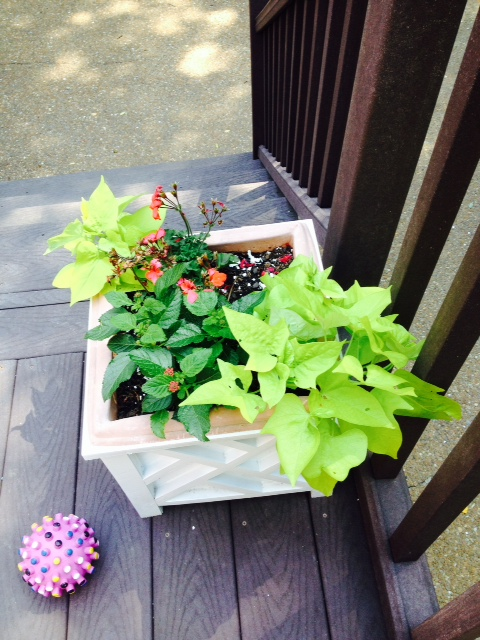 Sweet potato vines tend to get ‘buggy’ and the bugs eat holes in the leaves making them not-too-attractive. This should solve the problem providing I spray them every few days. Place apple cider vinegar and aspirin tablet in a container and let tablet dissolve. Then pour aspirin/vinegar into water, add soap and Miracle Gro, mix well. Spray with one of those pump sprayers lightly onto your plants. For roses, the directions say do this every 2 weeks for black spot. This is the first time I’ve tried it on sweet potato vines, but it should work for them as well. An empty large jug of white vinegar is a good way to save/mix this spray. Keep it in the garage and label so you know what it is. I don’t have to use much of it each time, but I do use it often. 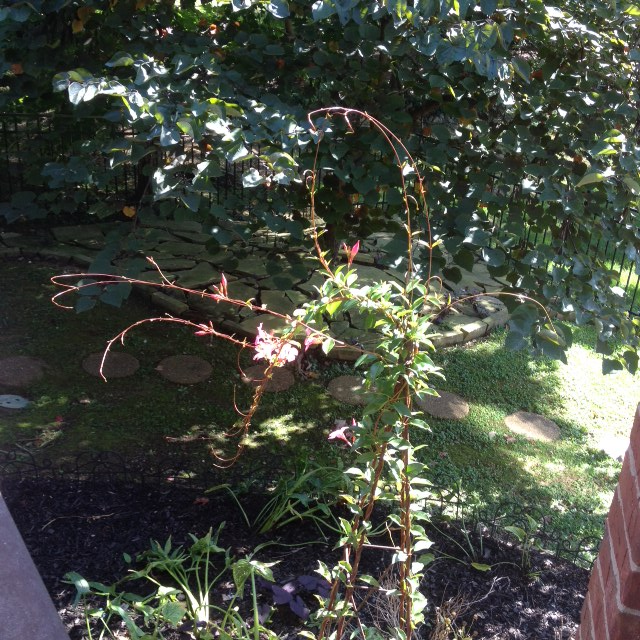 **Roses: I have “Knockout” roses which have contracted “Witches’ Broom” disease I fear. If it is that, there is nothing which can save them. So, I’ve a plan to replace them all this fall—PLUS the soil. Sure. That’s right, you just go ahead, Weeders, and agree with Jabber. But take a look at these pictures, all taken from the same angle at different times of the day and THEN tell me this thing isn’t threatening! Look how it keeps trying to reach out and GRAB something! Reminds me of the musical, “Little Shop of Horrors,’’ (http://en.wikipedia.org/wiki/Little_Shop_of_Horrors_(film) except this one is right next to my kitchen window. Below, 10 a.m. yes, she was looking right at me! Audrey the III, that’s what it is! Searching for something to latch on to! See photos below and then tell me it isn’t Audrey III. 11:20 a.m., Audrey III is reaching for the house. Not only that, she seems to turn counter-clockwise about 180 degrees every 4 to 5 hours. 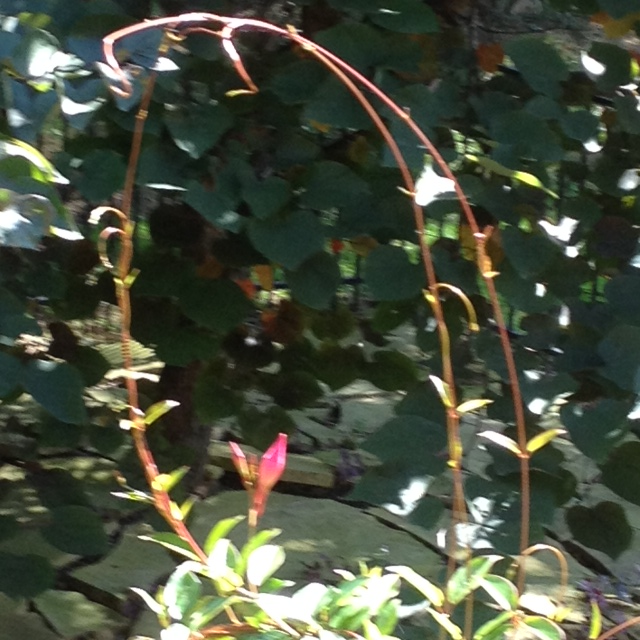 And her tip opens, then forms a circle, then opens again, reaching, reaching……..and she’s growing, too. It’s 12:45 p.m. Do you know where your plant is? Audrey III LIVES. Do you think she’s an alien? Surprise Lilies, that is. Anyway, that’s what my mother used to call them. 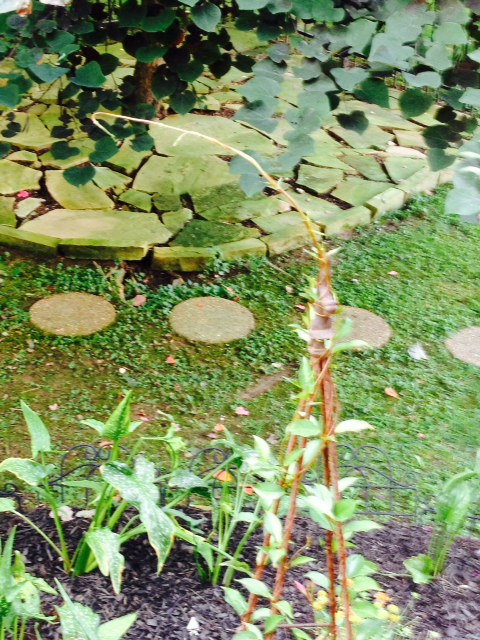 They are rain lilies, over 100 years old, from my grandmother’s garden. They are bulbs. They winter over nicely in or out of the pot under the house. All they need is a lot of water and some sun………. 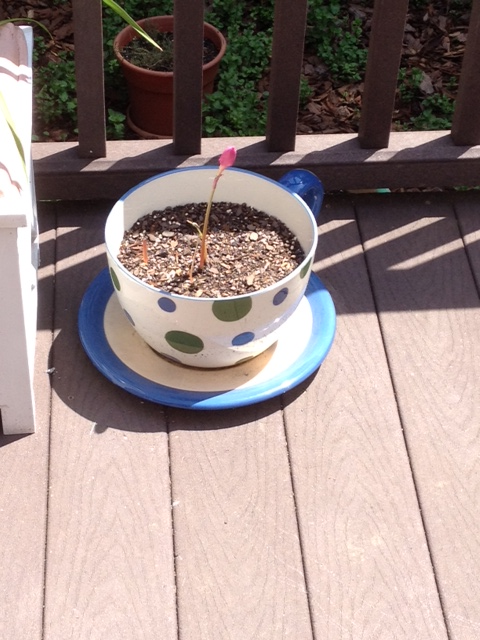 This one was actually planted last week—about 6 days ago. We had a heavy rain during the week, cool weather, and a lot of sun. Surprise! Lilies like that. I am always amazed by how things grow so quickly under the right conditions. We had our Bradford Pear trees trimmed back earlier this year. This in order to prevent them from splitting when a mighty wind came along. These trees are notorious for splitting. Ours had become quite tall. They are over 20 years old and most don’t last that long. 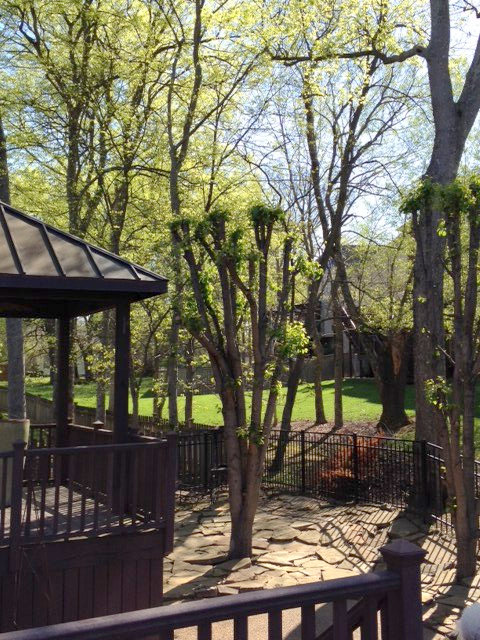 You can see the very TALL trees behind the Bradford Pear trees….. 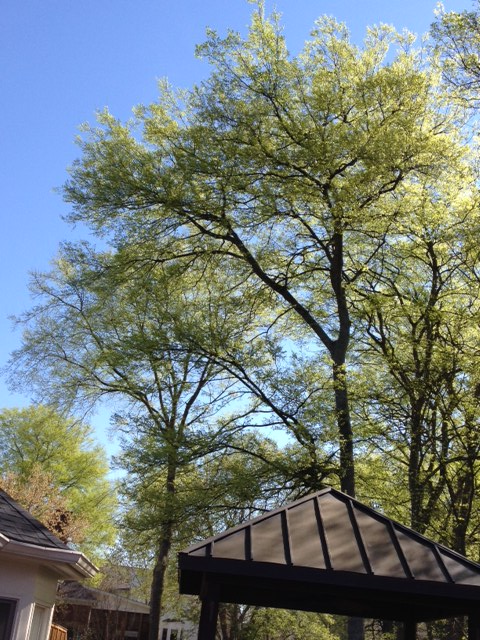 These other trees tower over our house and they DO worry me sometimes as they can bend and sway in the wind when a storm comes up. But they aren’t our trees………. 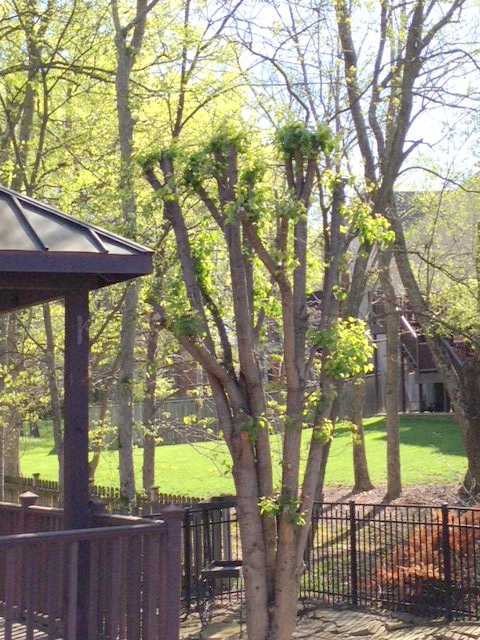 I chuckle when I look at our trimmed trees—they are growing sprouts at the top. Soon they will have branches and be full—it is amazing how much they can grow in a short while! 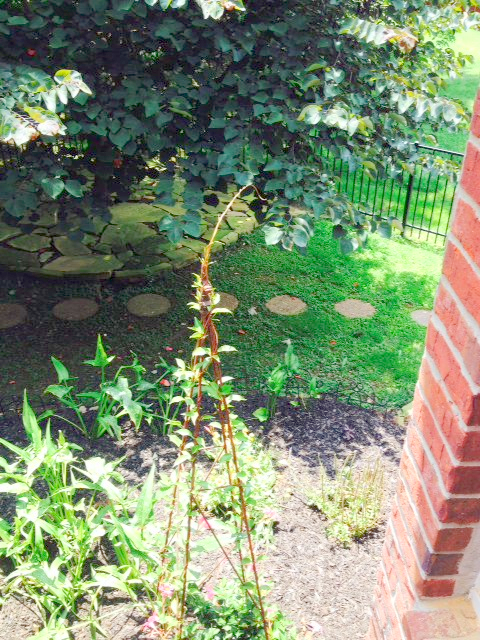 I think they look like cartoon trees—maybe from the book “The Lorax”? 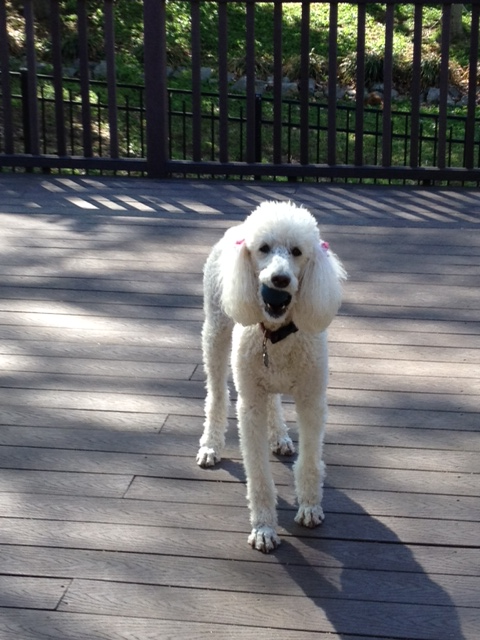 She can play, all by herself, for a while as she chases the bouncy ball around the deck. Security is 12 1/2 in human years—and does quite well for a ‘lady of a certain age.’ She can be very entertaining with her antics. 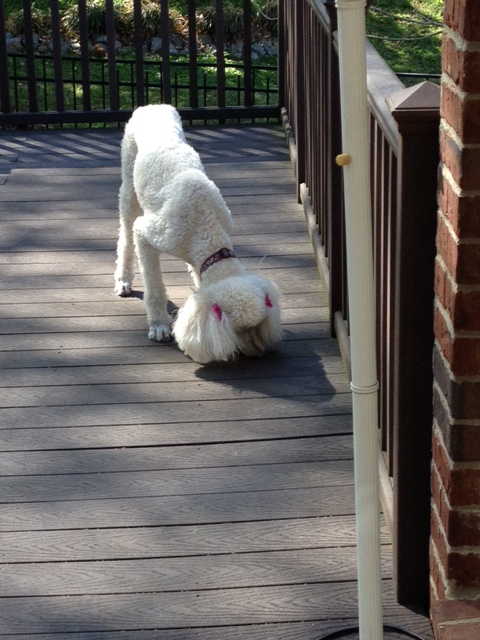 A long time ago someone told me that standard poodles can be clowns. While Security would bristle at such a label, I think she IS at times. Sometimes I live in a cartoon world!